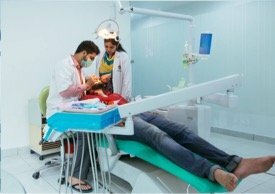 Now a days, people are approaching dentists with a shady smile in hope to get a brighter one by undergoing a teeth whitening procedure. Many factors like tea, coffee, red wine, smoking and the natural aging of teeth contribute to teeth discoloration. With age, the thickness of natural enamel decreases and more dentin color shows off giving a yellowish hue to the teeth. 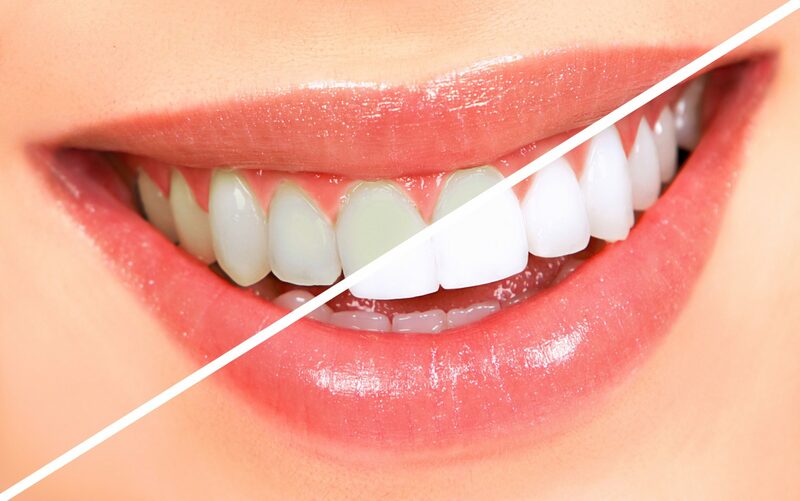 Teeth whitening is a process to whiten/brighten your own natural teeth without any complications like removing, cutting or edging of the teeth. Through this,we can get 3 to 6 shades brighter teeth compared to your natural ones. The process of teeth whitening performed by applying some chemicals to the teeth surfaces is named as Bleaching. Tooth is considered to be vital when the nerve in it is live without any damage. This process can be done in dental office by the trained dentists or at home by the individual itself. First, dentist will examine for the stains or any discolorations on your tooth surfaces and will advise the required procedure. 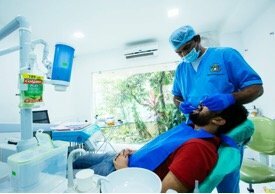 Later a routine dental cleaning will be done to remove any soft debris (pellicle) or hard deposits on the teeth surfaces and also do the necessary teeth fillings. Once the clean healthy tooth surface is attained, actual process of bleaching will be initiated. Photographs of your teeth are taken prior for further monitoring. Next a gel is applied onto the adjacent gum margins to act as a protective barrier from the whitening agent which we are using for the later process. Next the whitening agent which contains Hydrogen Peroxide will be applied to the tooth surfaces in order to bleach away any hard stains repeatedly until the desired shade is attained. Each sitting will take 60 to 90 minutes and the number of sittings may vary from 1-3 depending upon the severity of stain and the desirable shade. Also laser light can be used to activate the gel and render a faster action which is also known as power bleaching/teeth whitening. The previously Root canal treated tooth, which had got an severe discoloration cannot be treated simply by using whitening agent on its surface. The dentist makes a hole into the teeth and place the whitening agent and fills it back with temporary filling and leave it for several days. If the desired shade is not attained then the same process will be repeated again. Here with the help of special customized mouth trays whitening agent is applied to all the teeth surfaces. The mouth trays are customized to give a close fit to the teeth and hold the agent longtime in contact to the teeth surfaces. The duration of application varies from 4 to 6 weeks daily for some prescribed hours. But one should cautiously apply without hurting the gum margins. Teeth whitening achieved without any cutting or trimming of teeth enamel. Brighter smile with lots of confidence can be achieved. Along with this regular brushing, flossing and mouth rinsing are mandatory. Any dentist won’t give any guarantee on the result achieved through bleaching. Certain food restrictions have to be followed. Usually the original natural shades comes back within 6-12 months. Of course there are some results that have retained for longtime even. Whitening strips are thin flexible strips with whitening gel onto its surface. These are designed according to the tooth contour and shape and are directly applied to the teeth surfaces. The basic problem here is the person who is applying doesn’t know where it is getting sticked onto. More number of applications may also lead to teeth sensitivity. The dentist consultation is a must before one chooses to opt this procedure. Whitening tooth pastes are vividly available in the market now a days. These contain some abrasives which removes some external stains on teeth. Of course dentist advise is a must to initiate any of the above teeth whitening methods.